In 2004 Barack Obama gained national attention in the US when he delivered the keynote address at the Democratic National Convention but it wasn’t until 2007, following his announcement that he would be running for the presidency that questions about his nationality and especially his religion began to be raised in the right-wing media. As Stephen Colbert highlights in the short clip above, fully six years later and now well into his second term as President of the United States, a significant minority of the US public still believe that Obama is a Muslim and/or is not an American by birth. The fact that he regularly attends a Christian church and has provided certified copies (short and long form) of his birth certificate has failed to satisfy the more trenchant of his detractors among whom Fox News and Donald Trump are two of the more notable conspiracy theorists. It goes without saying that overwhelmingly these unfounded and disproved beliefs are widely held among the Tea Party guerrilla movement that still thrives within the Republican Party. So much scorn has been poured on to the Tea Party members (‘Teabaggers’) in the last few years that there is little point in my adding to the crescendo of criticism that has been published on and off line about their collective stupidity on these matters (although for my own amusement I intend to add my two pence worth at a later date) – especially since all of this text is really just a cover for me to put a couple of amusing videos on my blog! During Barack Obama‘s campaign for president and in the years following his election, many conspiracy theories have been circulated, asserting that he is not a natural-born citizen of the United States and consequently, under Article Two of the U.S. Constitution, is ineligible to be President of the United States. Theories allege that Obama’s published birth certificate is a forgery—that his actual birthplace is not Hawaii but Kenya. Other theories allege that Obama became a citizen of Indonesia in childhood, thereby losing his U.S. citizenship. Still others claim that Obama is not a natural-born U.S. citizen because he was born a dual citizen (British and American). Some political commentators have characterized these various claims as a racist reaction to Obama’s status as the first African American president of the United States. Such claims have been promoted by fringe theorists (“birthers“), some of whom have sought court rulings either declaring Obama ineligible to take office, or granting access to various documents which they claim exist, and which they claim would evidence such ineligibility; none of these efforts have been successful. Some political opponents, especially in the Republican Party, have expressed skepticism about Obama’s citizenship or been unwilling to acknowledge it; some have proposed legislation which would require presidential candidates to provide proof of eligibility. Expressed belief in such theories has persisted despite Obama’s pre-election release of his official Hawaiian birth certificate in 2008; confirmation, based on the original documents, by the Hawaii Department of Health; the April 2011 release of a certified copy of Obama’s original Certificate of Live Birth (or long-form birth certificate); and contemporaneous birth announcements published in two Hawaii newspapers. Polls conducted in 2010 suggested that at least one quarter of adult Americans said that they doubted Obama’s U.S. birth, while a May 2011 Gallup poll found that 13% of American adults (23% of Republicans) continued to express such doubts. Obama was baptized into the United Church of Christ (UCC) denomination and formally joined it in 1988. He left the UCC in 2008 because of the Rev. Jeremiah Wright controversy. He now worships with a Southern Baptist pastor at Camp David but has not become a formal member of any church since 2008. Though Obama is a practicing Christian, and he was chiefly raised by his mother and her parents who were Christians, both his father Barack Obama, Sr. with whom he lived only as a baby, and his stepfather Lolo Soetoro with whom he lived during his early childhood were nominally Muslims. This familial connection to Islam, among other things, is the basis of a common claim lodged by conspiracy theorists that Obama secretly practices Islam. A chain e-mail circulating during the presidential campaign claimed that Obama took his oath of office as a U.S. Senator in 2005 while placing his hand on a Qur’an rather than a Bible. This claim is false, as Obama was sworn into office using a Bible that he owned. The claim may have been inspired by a photo-op re-enactment of the 2007 swearing-in of U.S. Representative Keith Ellison of Minnesota, who used a Qur’an that had belonged to Thomas Jefferson. 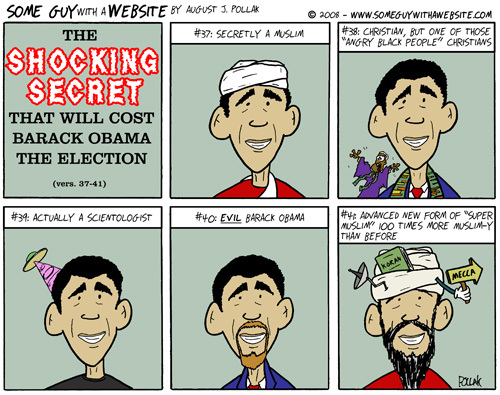 An early version of a rumor that Obama had “spent at least four years in a so-called madrassa, or Muslim seminary, in Indonesia” was found in an article published by Insight on the News, a magazine that was published by News World Communications, an international media conglomerate then owned by the Unification Church. Insight on the News ceased publication soon after the incident. Its editor, Jeff Kuhner, claimed that a person working for the Clinton campaign had told him that the campaign was “preparing an accusation that her rival Senator Barack Obama had covered up a brief period he had spent in an Islamic religious school in Indonesia when he was six”. Senator Clinton denied the allegations. When interviewed by the New York Times, Kuhner did not name the person said to be his reporter’s source. Obama attended two schools during the four years he lived in Indonesia as a child (1967–1971). From the first grade until some time in the third grade he attended the Roman Catholic St. Francis Assisi School, where classes began and ended each day with Christian prayers. He was registered there as Muslim because of his stepfather’s nominal religion. At some point during the third grade he transferred to State Elementary School Menteng 01, also known as Besuki School, for less than a year. Besuki is a secular public school. Students there wear Western clothing, and the Chicago Tribune described the school as “so progressive that teachers wore miniskirts and all students were encouraged to celebrate Christmas”. One chain e-mail claimed incorrectly that President Obama’s middle name is Mohammed or Muhammed. His actual middle name is Hussein. Obama is a Christian whose religious views developed in his adult life. He wrote in The Audacity of Hope that he “was not raised in a religious household”. He described his mother, raised by non-religious parents (whom Obama has specified elsewhere as “non-practicing Methodists and Baptists“), as being detached from religion, yet “in many ways the most spiritually awakened person that I have ever known”. He described his father as a “confirmed atheist” by the time his parents met, and his stepfather as “a man who saw religion as not particularly useful.” Obama explained how, through working with black churches as a community organizer while in his twenties, he came to understand “the power of the African-American religious tradition to spur social change”. Obama met Trinity United Church of Christ pastor Rev. Jeremiah Wright in October 1987, and became a member of Trinity in 1992. He resigned from Trinity in May 2008 during his first presidential campaign after controversial statements by Wright were publicized. After a prolonged effort to find a church to attend regularly in Washington, Obama announced in June 2009 that his primary place of worship would be the Evergreen Chapel at Camp David.